Make sure Zoku™ maker has chilled in freezer at least 24 hours. CANDY CORN POPS: Mix milk and Greek yogurt. Remove Zoku™ maker from freezer. Add pop handles to maker. Pour 1/3 of the yogurt mixture into each mold. Allow to freeze 2 minutes. Divide the orange juice into 2 small bowls -- one with 3/4 cup liquid and the other with 1/2 cup. 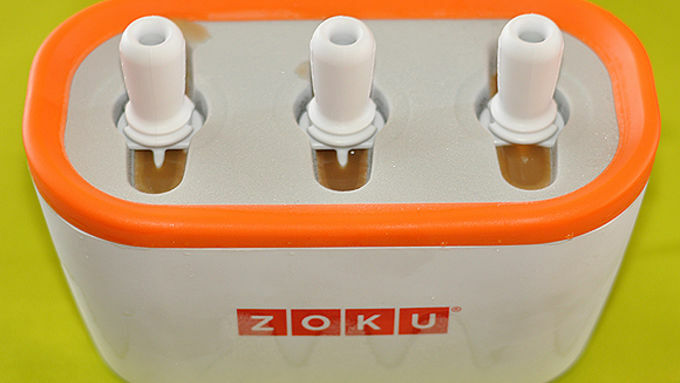 Divide the 3/4 cup orange juice evenly between the 3 Zoku™ molds. Allow to freeze 2 to 3 minutes until firm. Add the pomegranate juice to the remaining 1/2 cup orange juice, stir, and divide evenly between the 3 molds, filling to the fill line. Allow to freeze solid. 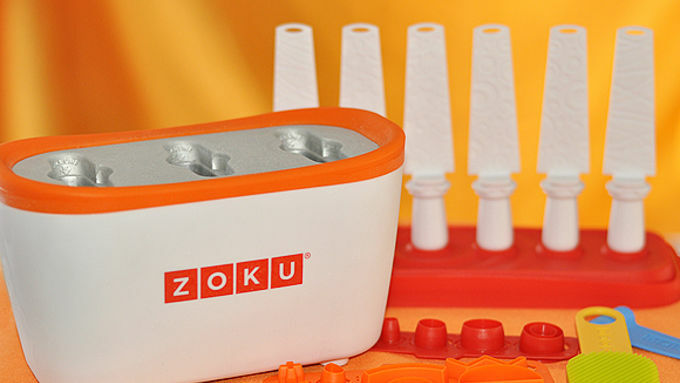 Remove pops with the Zoku™ super tool. JACK o' LANTERN POPS: Cut Jack o' Lantern features from Fruit Roll-Ups using the Zoku™ tools or a sharp knife (6 eyes, 3 noses, 3 mouths). Dip features into water, then set on the Zoku™ placement tool in a face pattern. Place Zoku™ maker on end, and press features to the side of the frozen mold. Repeat for remaining 2 molds. Place handles in maker, then fill to the fill lines with orange juice. Allow to freeze solid before removing with the Zoku™ super tool. FREAKY SPIDER POPS: Peel one string of licorice and cut to lengths for spider legs, about 3/4 each. Using a Gusher piece as the spider body, press legs to body, then press body firmly with a spatula to flatten as much as possible. 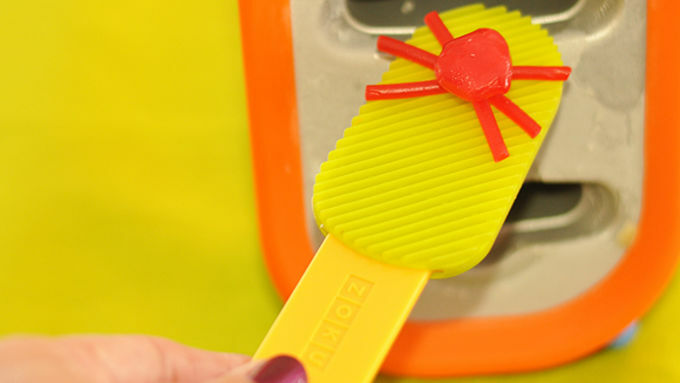 Dip spider into water, then use the placement tool or thin knife to press it to the side of the frozen Zoku™ mold (with maker standing on end), body toward the mold side. Repeat for remaining 2 molds. Place handles in maker, then fill to fill lines with green sports drink. Allow to freeze solid before removing pops with super tool. Store frozen pops in the freezer until serving, either in a Zoku™ pops storage case or other airtight container. This recipe uses a Zoku™ Quick Pop Maker. You can freeze pops in small disposable plastic cups instead if desired, but freezing times will be significantly longer. See Zoku Home for product info. I can Zoku … canu? 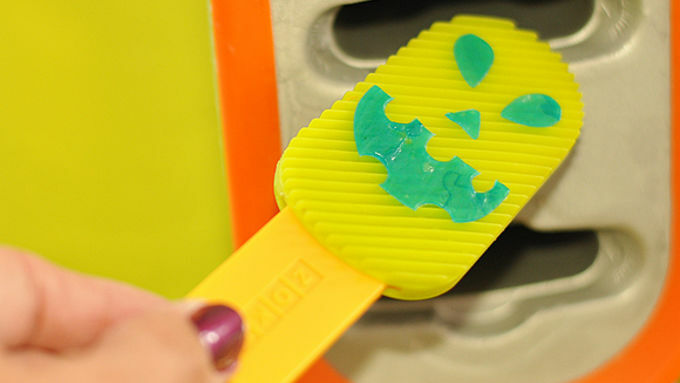 Here’s the easy way to make fun, spooky freezer pops this Halloween, using a cool new tool! Candy for Halloween? Come on, Chief -- you can do better. 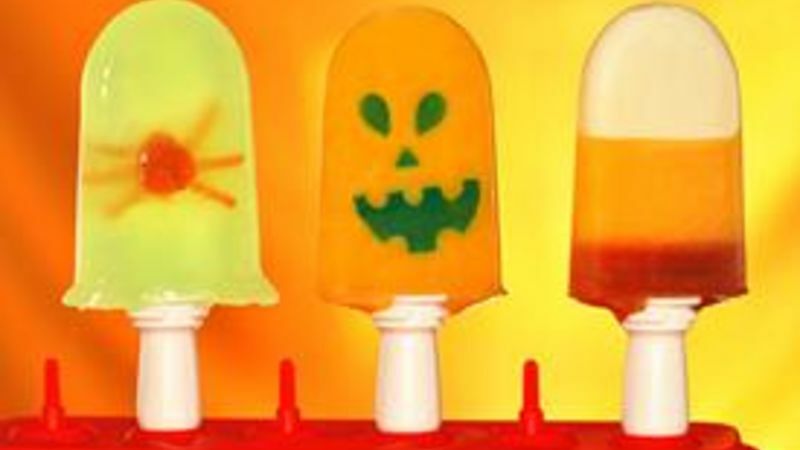 This year, make cool, spooky Halloween Freezer Pops that’ll give a chilly thrilly right up the spine. And maybe even one of those awesome icy head rushes, too. You could make these in your freezer using a regular ol’ plastic pop mold or plastic cups with sticks. Umm hmm. ORRRR, you could get one-a these way cooler Zoku Quick Pop Makers. This thing is a crazy great design. It’s like they nabbed somebody from Apple to figure out this piece of kitchen wizardry. iPops. Has a nice ring to it. But then, so does Zoku. Puckers up the lips like a kiss. Somebody done good with the rounded edges and all the fun plastic doodads that make you a pop star in minutes. The Zoku maker has to chill out in your freezer for 24 hours before you make the pops. (You can just STORE it in your freezer so it’s ready any time you want quick pops.) But THEEEEN, the pops freeze in this maker ON YOUR COUNTER in just a few MINUTES! Not even kidding – you actually watch them freeze before your very own googly eyes. I’m already bouncing off the walls with Thanksgiving pops and Christmas pops ideas and … NEW YEAR'S POPS…OMG! Edible GLITTER and CHAMPAGNE! I’m all over it!